Share "Is The Swimming Pool Safe For Your Pets? " The pool is a great place for your family and pets to spend their summers. It’s the perfect solution to cooling down, soaking up some sun, and having lots of fun. However, like with small children, your dog can potentially be at risk of getting hurt if not properly supervised. Not all dogs are great swimmers and not all pools are considered dog friendly. Rule number one for pet pool safety is to never leave your pet unattended around a pool. This has the potential to be a very dangerous situation. 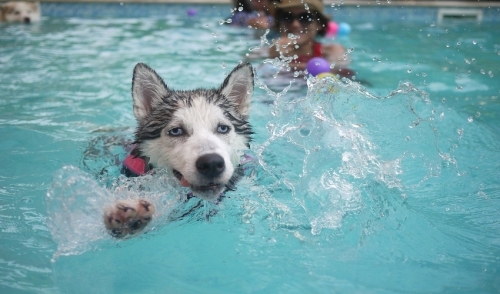 If you are aware that your dog is not a great swimmer, then invest in a life jacket to improve buoyancy. This will keep your dog more visible if it is small and can provide an extra bit of safety. You should never just assume that all dogs can swim. Some dogs need to be trained to swim while some are naturals and for others it’s nearly impossible. Recognize which category your dog falls under early on and be sure to take the proper precautions to guarantee its health and safety and to avoid the potential of drowning. Also, if your dog is older or has an injury like arthritis, it would be beneficial to make sure it has a vest. Dogs must be introduced to water properly before they can begin to have fun. Pets are easily irritated by chlorine. Like humans their eyes and skin can get potentially aggravated if proper steps are not taken. Make sure you wash your dog off with fresh water to avoid skin irritation and damage to your home when the dog re-enters the house. Even though it may be tempting, refrain from allowing your dog to drink the pool water. The chlorine and chemicals used in the pool will cause your dog to become sick with health problems such as dry mouth or gastric distress, which is no fun for anyone. Many of these same precautions and tips apply to ponds, rivers, and lakes as well. Although they are declared to be safer for dogs because they have better exits and a lack of chemicals, these places can also be harmful. Do not let your dog consume pond, puddle, or lake water. These areas are a common source of parasites that cause gastrointestinal issues that can also be passed on to other members of your family. Keep a close eye on them to make sure they do not wander and pick up any harmful objects such as dead fish or broken glass. Essentially, when it comes to pet safety around swimming pools, they are a lot like people. So before you make a big splash with your pet this season, keep these things in mind to ensure that everyone in your family has a safe, and exciting summer.